DUST-1 Manual (pdf-document, 630 KB). The satellite data product specifications requested by scientists, public authorities, schools, commercial users or the media are as varied as these groups themselves. However, data centers must concentrate on the operational generation of only a few selected data products, since their processing is elaborate and complex. This provided the motivation to develop easy-to-use software which takes into account user specifications collected over a long period of time, to combine it with data selected from the archives of the ATMOS User Center (AUC). DUST-1 focuses on providing software for processing level 3 data available at the AUC from the GOME (Global Ozone Monitoring Experiment), TOMS (Total Ozone Mapping Spectrometer), and MAS (Millimeter Wave Atmospheric Sounder) instruments. A calendar tool makes it easy to search for desired data sets on the CD-ROM. The software functionality includes visualization, animation, and mathematical/statistical processing of the data sets. Thus GOME and TOMS total ozone column densities can be displayed in either epicylindrical or spherical projections. It is possible to zoom into the projection or to enlarge spatially defined excerpts, whereby the cursor shows the location (lat/long) and the Dobson Units in a special window. The spherical projection can be rotated in any direction. For MAS data, which supplies the altitude profiles of water vapour and ozone, the software offers in addition to the zoom and excerpting functions the possibility of directly viewing the profile at a desired altitude, or of examining the entire profiles by scanning through the altitude intervals. The DUST-1 CD-ROM is the result of a collaboration between DFD-DLR (Oberpfaffenhofen), Max-Planck-Institut für Aeronomie (Katlenburg-Lindau), and Science-Softline. DUST-1 is bilingual (german/english). For detailed software description see the DUST-1 Manual. Order at: helpdesk, (Shipping & Handling: 15 EURO). The expected strong increase of atmospheric data will be a great challenge for all related data base systems. Graphical tools providing an obvious and intuitive interface to the data, both numerical and textual get increasingly important for data bases, proportional to the magnitude of the data flux. They assist in exploring, selecting from, and searching the database. They have been combined and investigated in context with a pilot project for the validation of atmospheric data, on behalf of the Max-Planck-Institut für Aeronomie in Katlenburg-Lindau, Germany. Here, classical and modern documentation methods – comprising data classification, storage and retrieval – and validation methods for selected data and texts of the Earth’s atmosphere can be interactively graphically linked and the results displayed. This is accompanied by some basic articles and a glossary in English and German. 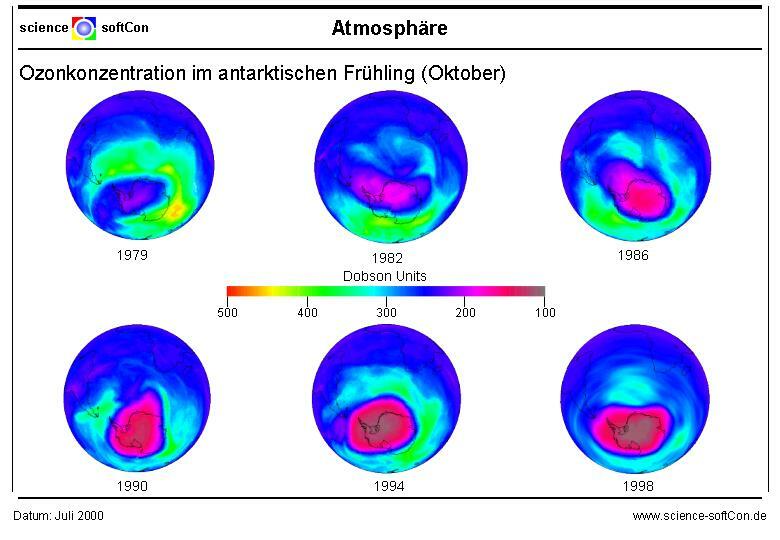 The software functionality includes visualization, animation and mathematical statistical processing and allows to reveal ozone trends or to ascertain differences between data sets. DUST-2 CD-ROM is a result of the above mentioned pilot project, and is intended to show the synergy of the graphical linkage between relevant texts and data and should help to improve the present unsatisfactorily availability of qualified filtered, direct useable information. In this context two (new) information processing methods were for the first time very successfully tested with data and texts from the Earth’s atmosphere, i.e. with ozone data and texts. The first is based on the method of Formal Concept Analysis (FCA), the second on document similarity measures and self organising maps. All this should further initiate and support related learning processes. DUST-2 combines three independent stand alone applications (DUST, Toscana, SOMAccess) via an HTML interface. A sample of processing and visualization of ozone data is given as view graph. The Datatable gives an overview about the data stored on DUST-2. This CD-ROM spectra data base is the result of a collaboration between Max-Planck-Institute for Chemistry Mainz, University of Essen, Research Center Karlsruhe and German Remote Sensing Data Center (DFD) of German Aerospace Research Establishment (DLR) Oberpfaffenhofen and is available free-of-charge for academic purposes (commercial users please contact our helpdesk). The CD-ROM contains about 1200 spectra and spectra data sheets of 120 atmospheric constituents in the uv/vis region. In addition a small visualization and processing tool is available. The 2nd edition (2003) of the CD-ROM "UV/Vis Spectra Data Base" (science-softCon Publication 0301, 2003) contains about 2000 spectra (high and low resolutions) and spectra data sheets of some 200 substances. In comparison to Version 1 ("UV/Vis Spectra of Atmospheric Constituents") new substance groups ("Aromatic Compounds" and "Hydrogen Carbons") are added to the data base. The content of the CD-ROM is the content of the on-line "UV/Vis Spectra Data Base" as of January 2003. The 3rd edition of the science-softCon "UV/Vis Spectra Data Base" contains about 2500 spectra/data sheets (ascii-format) of some 360 substances. The data base is subdivided into 16 substance groups. See the CD-cover. The 4th edition of the science-softCon "UV/Vis Spectra Data Base" contains about 2800 spectra/data sheets (ascii-format) of some 400 substances. The data base is subdivided into 19 substance groups. See the CD-cover. The CD-ROM is available for 100 EURO 80 EURO (50 EURO 40 EURO: academic utilization, universities, governmental organizations, non-profit organizations) plus shipping & handling 10 EURO. Order: helpdesk, by fax (+49 (0)6181 498415), or via your local bookseller (e.g. D A Information Services PTY LTD (Australia), Sanyo Trading Co., Ltd. (Japan) ), or via Copernicus; science-softCon Publication 0501 (ISBN 3-00-016199-6). The 5th edition of the science-softCon "UV/Vis Spectra Data Base" contains about 3200 spectra/data sheets (ascii-format) from published papers of some 550 substances. The data base is subdivided into 21 substance groups. See the CD-cover. The CD-ROM is available for 150 EURO 120 EURO(100 EURO 80 EURO: universities, governmental organizations, non-profit organizations) plus shipping & handling 10 EURO (free shipping & handling within Germany). Order: helpdesk, by fax (+49 (0)6181 498415), via your local bookseller or D A Information Services PTY LTD (Australia), Sanyo Trading Co., Ltd. (Japan) ); science-softCon Publication 0701 (ISBN 978-3-00-021327-4). The CD-ROM is available for 160 140 EURO (110 100 EURO: universities, governmental organizations, non-profit organizations) plus shipping & handling 10 EURO (free shipping & handling within Germany). We will provide customers who have purchased the 5th Edition Spectra CD an Update for 40 EURO, contact our helpdesk. Order: helpdesk, by fax (+49 (0)6181 498415), via your local bookseller or D A Information Services PTY LTD (Australia), Sanyo Trading Co., Ltd. (Japan) ); science-softCon Publication 0801. The CD-ROM is available for 160 EURO (110 EURO: universities, governmental organizations, non-profit organizations) plus shipping & handling 10 EURO (free shipping & handling within Germany). We will provide customers who have purchased the 6th Edition Spectra CD an Update for 40 EURO, contact our helpdesk. Order: helpdesk, by fax (+49 (0)6181 498415), via your local bookseller or D A Information Services PTY LTD (Australia), Sanyo Trading Co., Ltd. (Japan) ); science-softCon Publication 1001. The CD-ROM is available for 160 EURO (120 EURO: universities, governmental organizations, non-profit organizations) plus shipping & handling 10 EURO (free shipping & handling within Germany). Order: helpdesk, by fax (+49 (0)6181 498415), via your local bookseller or Infortrieve (USA), D A Information Services PTY LTD (Australia), Sanyo Trading Co., Ltd. (Japan); science-softCon Publication 1101. The 9th edition of the science-softCon "UV/Vis+ Spectra Data Base" contains about 6900 spectra/data sheets (ascii-format) as well as more than 1300 graphical representations and additional photochemistry information from published papers for about 1000 substances. The data base is subdivided into 27 substance groups. More Information. The CD-ROM is available for 180 EURO (160 EURO: universities, governmental organizations, non-profit organizations) plus shipping & handling 10 EURO (free shipping & handling within Germany). Order: helpdesk, by fax (+49 (0)6181 498415), via your local bookseller or Infortrieve (USA), D A Information Services PTY LTD (Australia), Sanyo Trading Co., Ltd. (Japan); science-softCon Publication 1301. The 10th edition of the science-softCon "UV/Vis+ Spectra Data Base" contains about 8300 spectra/data sheets (ascii-format) as well as about 3000 graphical representations and additional photochemistry information from published papers for about 1350 substances. The data base is subdivided into 28 substance groups. The CD-ROM is available for 200 EURO (180 EURO: universities, governmental organizations, non-profit organizations) plus shipping & handling 10 EURO (free shipping & handling within Germany). Order: helpdesk, by fax (+49 (0)6181 498415), via your local bookseller or Infortrieve (USA), D A Information Services PTY LTD (Australia), Sanyo Trading Co., Ltd. (Japan); science-softCon Publication 1501. The 11th edition of the science-softCon "UV/Vis+ Spectra Data Base" contains about 10500 spectra/data sheets (ascii-format) as well as about 3500 graphical representations and additional photochemistry information from published papers for about 2000 substances. The data base is subdivided into 28 substance groups. The CD-ROM is available for 240 EURO (200 EURO: universities, governmental organizations, non-profit organizations) plus shipping & handling 15 EURO (5 EURO shipping & handling within Germany). Payment terms: wire transfer, credit card. The purchase includes 12 months access to the on-line database. Order: helpdesk, by fax (+49 (0)6181 498415), via your local bookseller or S.Toeche-Mittler Verlagsbuchhandlung GmbH (Germany), Infortrieve (USA), D A Information Services PTY LTD (Australia), Sanyo Trading Co., Ltd. (Japan); science-softCon Publication 1701.